The saloon table is made of tasmanian oak ply with solid mouldings around the edges. It's sanded in these pics, but not varnished. The table is on 3 hinged legs, and is held in place in the "up" position with 2 dowelled wooden pins. Carol found the material for the cushions at $10 for 11 metres. After making these 4 cushions, there's still enough left to cover the single bunk cushions. I've made the table a little shorter than the maximum possible, to make it easier to get in and out of the seats. They seat 4 in comfort and 6 at a squeeze. The table is 100cm by 85cm. 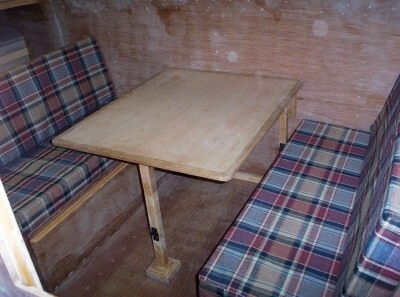 It took about 2 minutes to convert to the double bunk - the table swings down and the seat bases also get turned around so they are horizontal rather than angled back. The backrest cushions are the just the right size to go over the table. 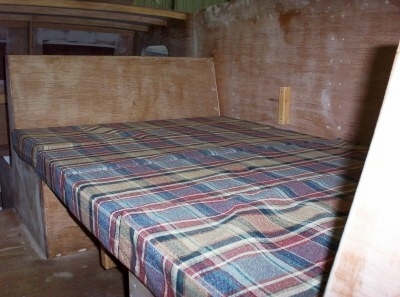 It probably won't get used much as a bunk, but will certainly be very roomy and comfortable. It's about 190cm by 125cm. 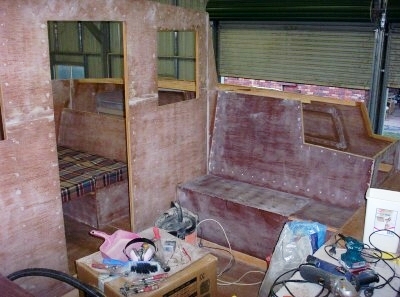 There are now cockpit seats (in varying stages of completion), and the backrests comlete the interior sides of the toilet and pantry areas. The cockpit is huge, compared to what I am used to. The seats easily seat 3 people a side. There's a fuel locker under each seat at the back. Each holds two 12 litre tanks - I find it easier to carry a 12 litre tank in each arm rather than lug a 24litre tank around. There's also space for an extra fuel tank in front of the outboards, if needed. All the stringers are in for the cabin top. 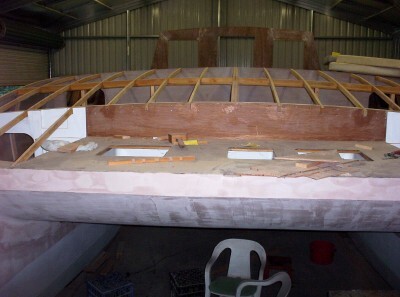 Next I need to paint all the interior, before starting to glue the cabin top in place. Painting should be a pretty fast job once I actually start. It's spray painting, with 2-pak water-based epoxy primer/undercoat and 2-pak water-based urethane. These paints are great for enclosed areas, as they don't produce the iso-cyanates usually associated with 2-pak products. I'll be using a full face mask with positive ventilation as well.